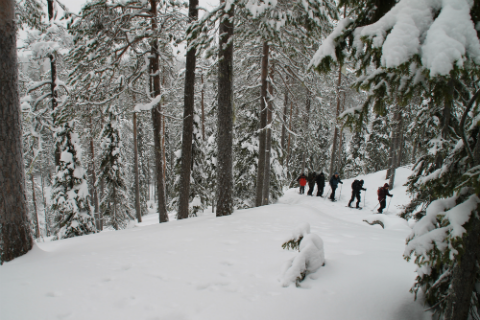 Just as hiking during summertime, snowshoeing is one of the top activities of winter up here. 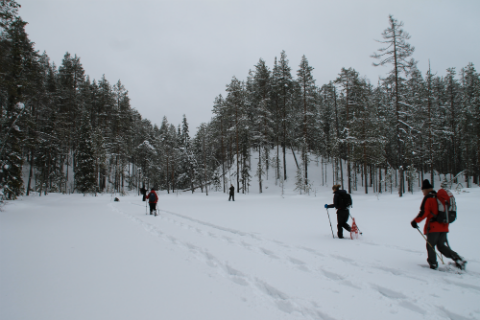 Making your way through the winter wonderland with snowshoes is a simple yet very comprehensive experience. Everyman´s rights ensure that it´s possible to walk almost anywhere and this makes it even more adventurous! Observing animals and their tracks while being surrounded by the silent wilderness and you are sure to leave your daily routines and forget the realities back home. And we have a snow guarantee for the best winter months! For health and fitness benefits, snowshoeing is an effective, low impact and safe form of exercise so it´s really good for you. It provides a cardio workout while also building strength, agility, balance and endurance. Plus it’s low cost, easily mastered and fun. But the best part is, you get to do it all in the beautiful outdoors, giving your mind a dip in the wild! The Hossa area has vast wilderness areas to conquer and the distances are short so it´s possible to arrange a daily snowshoe hike on different location each day, you deciding the amount of challenge.